Many people experience overpowering or disturbing emotions while tapering and as part of withdrawal syndrome. The best way to treat this is to help your nervous system to repair itself, to return to its "factory-installed" state. Recovery from withdrawal syndrome is gradual, inconsistent, and can take a long time. In the meantime, you can help your nervous system heal by using non-drug techniques to lessen your anxiety about your condition, deal with long-standing emotional issues, and cope with symptoms. You may also get anxious or depressed about having odd symptoms because you have beliefs that add to your distress, such as a feeling of helplessness or being a failure. Or, you may feel strong emotions as the drugs no longer mask underlying emotional pain. Read these non-drug techniques to cope with emotional symptoms for ideas that may aid your recovery. Whether they are "neuro-emotions" caused by neurological upset, distress arising from your situation, or a natural disposition towards worrying, anxiety, pessimism, or self-sabotage, learning techniques to manage them will benefit you throughout your life. "Is it always going to be like this?" What does healing from withdrawal syndrome feel like? Withdrawal causing intrusive or repetitive thoughts, rumination, and increased panic? Blaming yourself for mistakes? Try this. experiment with the distance from the wall...then lay there and mindfully breath into your belly...hands on chest and belly can be nice...it's really GREAT! and can reset the entire system, I've found. A good old fashioned epsom salt bath! Interesting about the poses. I need to try that. One thing that I've found fool proof to relied my distress is to help another person with their distress. Unfortunately this doesn't work, for me anyway, over the Internet. But I feel a lot of relief when I talk to my friends or anybody really either by phone or in person and focus my mind away from my own situation. This is really big in AA. When the founder first started it he tried to get other drunks sober but they all, at first, went back to drinking. He complained to his wife that it wasn't working and he might give it up. She told him, "but you're not drinking Bill, this is the longest you've ever been sober." Anyway, that's why I want to get a phone list together. To be needed is powerful. And very distracting in a good way, not that i wish problems on anyone. I've printed up contact cards "I'll run for you" to do those errands that most people complain about day-to-day. When friends were having kids and couldn't get out as easily, for example. People are very hesitant to ask for help (myself included). Phone list is a good idea, Alex. Especially if people find themselves in a health situation unexpectedly...getting stung by wasps and ending up in ER, for example. Hello again all. I figured i'd add my two cents here and mention something that has worked for me. I have many times taken a hot bath while listening to relaxing "Spa" type music. I have an internet radio app on my smartphone called "Slacker Radio" (identical to Pandora) that has a station titled "Spa" which has nothing but relaxing music that makes the bath all the more enjoyable. It really helpes calm my mind while in the tub. I've even listened to it while driving home from work after a hard day to calm my mind. If you don't have a smartphone i'm betting that there are a plentiful amount of cd's available that will serve the same purpose. Oh, and since Slacker is an internet radio service it is easily accessed via any computer at slacker.com. You'll find "Spa" in the category of "Chill" stations. Give it a listen, it's FREE and very soothing. Group therapy worked really well for me for PSSD (and the comparisons upthread to Bill W & AA are particularly well taken in this respect.) Attachment is the best way of regulating affect and restoring some kind of homeostasis to my brain-- whether the disregulation is chemical, environmental, pharmacological or some combination of the above. What goes along with this, though, is developing an aggressive strategy for attacking shame and self-blame, and that's much harder. You can't get to group or call a friend if you can't get out of bed, or are too depressed to do anything because you think you did something wrong. This is distorted thinking, and it's really seductive. I am now deep into Healy's "Let Them Eat Prozac," and one thing he noted in a very small study with subjects who were not clinically depressed was that one side effect of SSRIs is that we start believing we are defective. Even scientists and medical professionals who knew, intellectually, that SSRIs might cause suicidal ideation or severe side effects that were not reported in the literature began believing that intrusive thoughts caused by the drugs-- or their withdrawal-- were somehow the result of some underlying psychological problem they had not recognized before. AND they were sometimes resistant to discontinuing the drugs, even though they knew, intellectually, that this was irrational. This is why, on a bad day, you have to make yourself call friends, or get out to group or some kind of social activity even if you do not feel like it. It almost may not even matter exactly which group you choose. Pick one and go for it. Again this is nothing that has not been said already, just a slightly different way of thinking about it that might be helpful. I would say out loud "Not you again" your analysis does not work. I have learned not to analyse, but take things in my stride one day at a time. How can I admit that I am in pain, find the source of it, eliminate the source and finally deal with it? Please please please help.Thank you! To heal emotional pain, you need to first name the pain, whether it is anger, fear, sadness, or jealousy, etc… Then allow yourself to feel where in your body that emotional pain is stored. Spend some time letting yourself fully describe everything you can about the physical sensation associated with the emotional pain. Notice whether it feels achy, throbbing, sharp, heavy, dark, swirly, hot, numbed, rigid, or whatever it is. Be with that feeling in the body, breathe long easy breaths into that area of sensation with the mental and emotional intention of acknowledging, releasing and healing the injury as well as the misunderstanding that led you to perceive the event the way you did. Be loving, compassionate and patient with yourself during this process and continue until there is a noticeable shift in the physical sensation to where it no longer dominates your attention. That will indicate that you have cleared a certain chunk or level of your stored pain, and that is probably enough for the time being. Next time repeat the process to access and release a deeper level. Each time you will be more freed up and more your real self. Eventually the entire pain and its repercussions will be cleared away. The only thing that helped me so far is changing objects, habits, friends and environment gradually. I think change faciliates formation of new connections and thus healing. Throwing or donating stuff at home I don't need or bought for no good reason was little helpful. Freeing myself from things, places or people that irritate me makes me feel less bad. Changing habits or even buying new things instead of the ones I gave away could be helpful. Otherwise the symptoms are cruel and tend to get worse by time for me regardless of how much time I work, exercise or what I eat. Highly recommended. Can buy used on Amazon for $4. 2-Dialectic Behavioral Therapy (DBT): Initially created for people with Borderline Personality Disorder, it is now used as a set of skills that can be used by anyone who wants to regulate their emotions better. It mixes cognitive-behavioral and mindfulness-based therapies. There is an awesome Yahoo! group where you learn the emotional regulation skills and do homework every week. Then you receive feedback from the moderators and read what other people share from their own homework. It's a cycle of several; weeks. Since these skills need a lot of practice, you can repeat the cycle as many times as you want. 3-Fish oil:I hope I'm not being repetitive, as I have not finished reading the fish oil thread yet. The main thing with fish oil is 1) DHA/EPA concentration; and 2) taking a quality supplement. Make sure you buy it from someone who carries fresh inventory, keeps stock in climate-controlled storage and ships fast, because fish oil can oxidize quickly when exposed to heat or light. The amber colored bottle protects some, but it's not good to risk it. Iherb is a good company to buy from. Also, keep it in the fridge and buy one bottle at a time to minimize risk of oxidation. 4-Mentoring: I found someone on the web that has had similar experiences with depression and we exchange e-mails often and check on each other. This is different than an online forum or support group in that you get a more on-on-one type of relationship with someone who is very much going through the process of recovery at the same time as you are. I didn't realize how helpful it would be. I found her at a depression suppoprt group and she's helped me through more than one crisis. I'm blessed with a caring family and a couple of close friends, but sometimes you really need someone who has been exactly where you have been. 5-Gardening and pets: it's like meditation. You get engaged in an activity that brings you joy without any expectations of performance. It's an easy way to get immersed in the moment and have contact with nature. With pets there is also unconditional love and acceptance. 6-6-8 deep breaths several times a day, even when I'm not stressed help me be less stessed overall. It's hard to keep doing regularly, but even if you just do it sometimes, it helps. When you're faced with increased stress, it becomes more natural and easier to self-regulate your stress response with deep breathing and induce relaxation. 7-Have a regular "no cares" time when you literally allow yourself not to give a fu** about anything. Nothing. You can do one 30 minute session instead of 2 10-minute ones. You can also write down your worries throughout the day, as long as you don't allow yourself to worry about them until worry time. 9-If you can exercise, even just go out for a walk, by all means do it. It helps the brain work better in every way. 10-Hope: it may sound strange, since hopelesness is such a core part of the problem we faced. Still, hope is a choice. It's a choice that increases the odds of better outcomes (this has been researched ad nauseum). And we lose nothing by leaving a little window open to hope. Hope some of it helps! The other resource I have really found fascinating is a book I got from the library called Cracked: The Unhappy Truth about Psychiatry by James Davies. The 13th chapter (how to fix the cracks) was especially interesting for its take on the relationship between mental health and our society. Whenever you see yourself in the mirror, smile. Do it every time for months no matter how sh*tty you feel. Even if you are crying your eyes out. You'll surprised how much it changes the way you see yourself. What a great tip, MP. (The timer). It addresses the feeling that sometimes keeps me from starting a chore: this will take forever and I will never finish. Having the timer means you do not have to finish...you just have to start. How would you treat someone with very severe anxiety, ocd, depression, without medication? Like they've had it for most of their lives to the point where if they were to not be medicated they would likely self harm or something. What would you suggest as effective treatment to someone like that? Gained while approaching the rugged cliffs on the Northern California coast. You approach the cliff. It is terrifying. You can feel the dreadful pull into the raging surf. You look at the boiling water hundreds of feet below. Sheer cliffs, sheer terror. There is no fence or guardrail - it is up to you to take care of yourself. Do you flee in fear, running to safety far from the dramatic upheaval of the cliffs? Hide from the fear, never to face it again? Instead, go as close to the fear as you can. When it becomes too much, take one step back - just one - to feel safer. Drop to your knees, ground, make sure of your safety. YOU CAN DO THIS. From your hands and knees, you can crawl closer to that chasm of panic. You can control how close you get to the dread edge - the end of your very world. Crawl. One tiny step of hand, of knee - you may find that you can get very close to the edge of your fear. Then, lie down. Face your fear. Look at it. Look down the cliffs and be amazed. The wonder, the awesome power of the raging surf, the flight of birds around the floating kelp. The secret caverns that the surf explores, the rhythm of the ocean against the submerged rocks. Get to know your cliff. Become one with it - and yet - you are safe. You can experience your emotions from a safe place. The fear will not kill you - but what you do about it makes all the difference. The fear may not subside, but you can control how much of it you take in, if you take time to step back, ground, and do what you need to be safe. Sometimes that may mean not going out of the house. Or maybe your cliff is driving the car. Or seeing or talking to people. Challenge that fear by finding a safe way - like a child - on your hands and knees - to explore that thing you fear. Sit in the car without driving it. Walk around the yard without going anywhere. Make one phone call to someone safe, someone comfortable. When you go back to the cliff the next time, you may not be as afraid of that abyss. You may still be filled with horror at the thought of the cliff. Maybe you cannot get any closer without stepping back, going to your hands and knees, to a place of safety, in order to explore your fear. But - at least you know what lies beyond the cliff. And you know that you have the power to control how close or how far away that cliff is. Thanks for writing down your insights - that ocean cliff is a picture I'm going to keep with me. some of the usual symptoms of withdrawal syndrome are de-personalization and brain frog.Fortunately I have nothing of them. However,I have found some info that might be of interest to some of you.There are mostly non-drug treatments,so the harm of using them is very low I think. I've found that building up as many non-drug tools as possible is the key to managing issues that I had pre-drugs (and were the reasons I initially started SSRIs). I think of it as weaving a held life. That is, I find a new idea (such as those listed in this topic) that seems like it would suit me. I write it down and stick it on my wall. I start to use it in my life, start to build up the habit of it. Then I go and find another idea, and build this into my life. Kind of like a bird builds a nest, I'm weaving together a whole bunch of things that will support my healing, and management of my underlying issues (depression, anxiety etc). One thing by itself may not do much, but the strength from the interwoven parts is greatly comforting and supportive. Off the top of my head, my 'bits of straw and feathers' have been: gentle yoga, meditation, counseling, journalling, eating whole foods, fish-oil & vit.E, deepening close friendships, hot baths with epsom salts, getting my hands in the garden, singing, reading here on S/A, resting when tired, having music ready to play in the night, having meals in the freezer, crying when I need to, learning to sit with my emotions, learning to ask my friends for help, drinking heaps of water. And as a bonus, the feeling that comes from knowing I'm actively making healing happen in my life becomes another bit of straw which strengthens the nest. There are many others but I don't feel well right now, I'll post them later. This exactly. Some of the things I have been forced to think about while tapering, has been what will I do when I'm off antidepressants? Ok, so I will get down from time to time; it's part of my personality I guess. What will I do to stop "down" from being "crash landed"? Two things I am working on is exercise - just moving - and sunlight. I am pretty lucky in Australia that for much of the year there is an abundance of light. What I am doing differently now, though, is not hibernating indoors with the blinds drawn - even in the middle of summer. I need at least 20 - 30 minutes of being outdoors per day. I have been thinking about getting a light box for winter - my town can get pretty grim and dark in the winter. Another good one for me is laughter - even hearing other people's contagious laughter will set me off. Funny vids on Youtube are great. Also, because deep down I am a bogan (redneck for Americans) when I crank something like "Thunderstruck" by AC/DC my knees start twitching, my feet start tapping, and maybe there's a little air guitar going on ... any music that gets my blood surging, makes me feel good. I like your view on the interwoven parts and how they comfort you as a whole. I too am now utilizing Journaling, meditation, meetings, peer/family support, this great forum...basically anything that helps me to better myself and my thought processes. As a whole, it definitely has helped! To better days! I have been spending a lot of time in the sun the last few days - it seems to me that this has helped my w/d symptoms. Does anyone else have the same experience? I walk every day for at least an hour, rain or shine. Other areas of my healing have changed. I no longer take supplements and I do eat some junk food since my weight dropped back in March - this scared me as I thought I was ill. I am in regular contact with a fellow WD sufferer which is a huge deal and of great comfort, and now that the Support group is gaining momentum will have monthly meetings to look forward to. Also, I pray every day and do this on my walks. Thanks for this! And sorry for quoting not once, but twice...! -- something went wrong with my internet connection. This is a beautiful metaphor, and I will cherish it! I've been struggling with motivation lately and I was recently given a model for a daily planner that has really been helping me and I just want to share it in hopes that maybe someone will find this helpful too. I think my problem may have been that I am looking at recovering my old self as this huge ginormous endeavor that was in no way possible to ever complete. This planner has helped me keep things small into little 24 hour chunks and it has made life a lot easier for me and makes recovering myself seem less scary. I was given the model for this from a really good friend and I hope it will help you too as it is helping me. Hopefully the file attached and you can read it clearly and print it out. You can decide to make your own following this model or you can just print out mine. I used Microsoft Word to make mine. 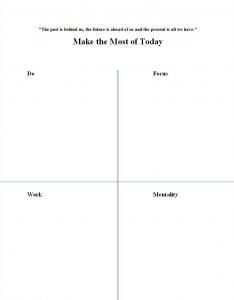 The Do quadrant is just for listing daily tasks that need to be accomplished for that day and just scratch them off one by one as you go. The 2nd quadrant "Focus" is for listing future goals and how in the now you are helping yourself get closer to achieving them. So just jot down some tasks that you will accomplish for that day that will help you get closer to achieving your big super awesome future goals. 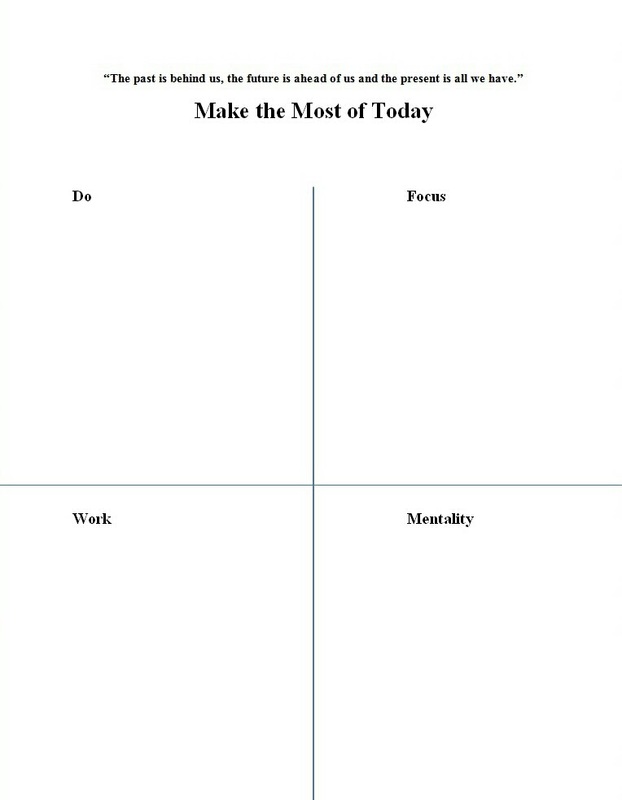 The 3rd quadrant is "Work" that quadrant personally I need because I am self employed and it helps me keep the jobs I need to finish for work for that day clear and listed out like I said you can make your own and make these quadrants whatever the heck you want. The model is whats most important. The 4th quadrant I titled mentality and it just helps me keep focus on the mind sets I want to internalize for that day. For example there are mind states that I found really easy to live from before the antidepressants that are a little harder to do now, but I still want to live from. Like focusing on love for myself and others, not getting discouraged that I'm not where I would like to be yet, staying positive, being kind to myself and etc. This quadrant is like a reminder to you about awesome qualities/mind states you may have had in the past before the crappy drugs that you want to cultivate and live from in the now. I printed out like a zillion of these and I mark them with pen in the upper left corner with the date for that day and write in my tasks for that day and then scratch off what I accomplish one by one as I go it is a super fulfilling feeling when you scratch off everything you meant to accomplish for that day. I apologize for my punctuation and I know I could have done a better job of explaining all of this, but I am in a hurry I just really wanted to share this I hope this will help someone else too. I guess we all had different journeys and reasons for starting taking AD in the first place. It took me a looong time to find out that I wasn't getting better by feeling sorry for myself - even if I think you are entitled to do so sometimes, just not all the time. It helped me a lot to figure out what I really like to do and what makes me feel good - and then DO it, enjoy it and think of how good it makes me feel. 1. The bucket of epsom salts or magnesium chloride. The weather is hotter now, and having that nice cool bucket to plunge my feet into is really grounding. I only need to sit or stand there for 5 minutes, but sometimes stay as long as 10. Instant attitude adjustment! listen. really listen to the music. 3. Zip it up - Uddiyana bandha. I've had yoga teachers who called it each of these things. One yoga teacher told me, in pose, to zip up my core, like running a zipper from bottom to top. Others have called it "naval to spine." My current teacher calls it by its proper Sanskrit name, "Uddiyana bandha." Thymus thumping - or drumming! You know when Tarzan used to yodel and pound his fists into his chest as a show of wild manliness? Well I learned this in kundalini yoga, long ago. The French word for heart, coeur, is the basis for our English word Courage. The heart is not about love, it's about bravery. Courage. The fires burning in your heart that make living worthwhile. Behind your breastbone, next to your heart is the thymus gland. It is a sort of master gland, like the pituitary, but it runs immune function. Tap with your right fingertips, 3 times, firmly but gently on your breastbone in the middle of your chest. Say as you tap - "I can do this!" (I like "I" = tap, "CAN" = tap, "DO" = tap, then hold the fingers there for "THIS.") Repeat with your left hand. If you really want to fire it up, you can try it Tarzan style (but not if you've been having cortisol spikes, works better for fatigue related conditions). I like your Day Planner, Danny! I used to do a similar thing with coloured stars. You know, the ones we used to get on our papers in kindergarten if we did a "Good Job!" it would be a gold star. Gold star = worked today. So I would put the stars on my calendar at days end, and watch my calendar fill up with "Good Job!" stars! 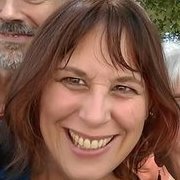 It was rewarding, and sometimes when I was frustrated - maybe I didn't get to work that day (I was also self-employed) - at least I ate fruit & veg, or exercised. I found that I could get at least one star a day, and often 3. The expectation was not to get all 5, but to do my best, and once the calendar started to fill up, it was motivation to try harder! It's good that you found a site that helps you. As for me, I find it therapeutic to refuse to believe in the bipolar label my shrink stigmatized me with. Willed lack of insight has done wonders for my self esteem! Legs up against the wall yoga pose works great for me with withdrawal anxiety. I'm a different person when I get up. Light a candle. Make it the only light in the whole room. Hold it in your hands and feel its warmth. Smell the wick and the wax. Breathe, and share oxygen with it. Sometimes, you can even hear it (I have wood-wick candles that crackle like a campfire). Distraction, mindfulness, changing the channel. Just by lighting a candle.